A classic to delight your residents. Cooking mince with gravy adds flavour to the pureed meat, then blending and shaping it into sausages with good quality moulds, will make this dish look and taste like home. Heat oil in a large pan. Brown the beef and sausage mince well. Add KNORR Beef Booster, water, KNORR Rich Brown Gravy and KNORR Roux, and simmer for 25 minutes. Remove from heat, cool slightly then puree in a blender. Pour 1.1L of water in a large pot and bring to the boil. Remove from heat and whisk in CONTINENTAL Professional Instant Mashed Potato Mix, until smooth. Cover and place aside for use. Add 500ml of water and KNORR Rich Brown Gravy to a pan, bring to the boil and simmer, whisking for 2 minutes. 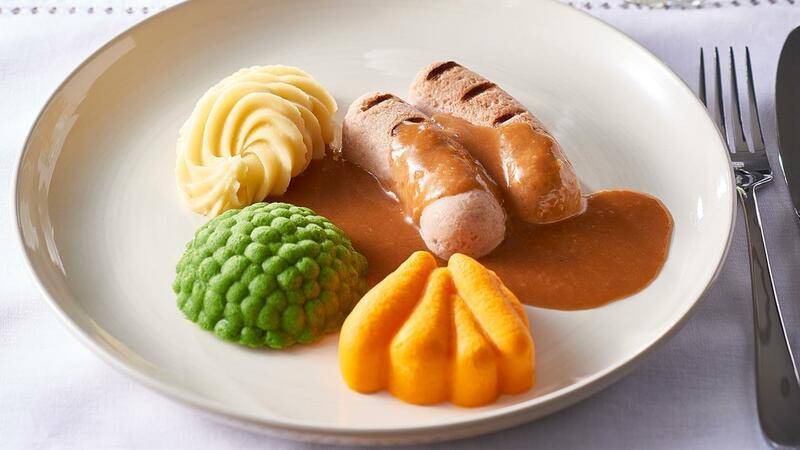 Remove sausages from their moulds, reheat and serve with CONTINENTAL Professional Instant Mashed Potato, gravy, pureed and shaped carrots and peas. Add char grill marks with a heated steel skewer taking care not to change the soft texture of the meat. To avoid skin forming on mash during reheating, simply cover with foil.